Metal Vapour Sources | » AlfaVakuo e.U. This kind of metal vapour source was developed by Alvatec Alkali Vacuum and Technologies GesmbH, therefore the name Alvasource is also in use. Other names are dispenser, evaporator, source, oven. The relatively low boiling point or sublimation point of alkali metals makes pure alkali metals inappropriate for use in high vacuum evaporators which are usually baked out at temperatures between 200°C and 400°C for many hours. This low boiling and sublimation temperature of pure alkali metals can however be significantly increased. Alkali metals form many stable, high melting intermetallic compounds with non-toxic metals, like indium, gallium, tin or bismuth. 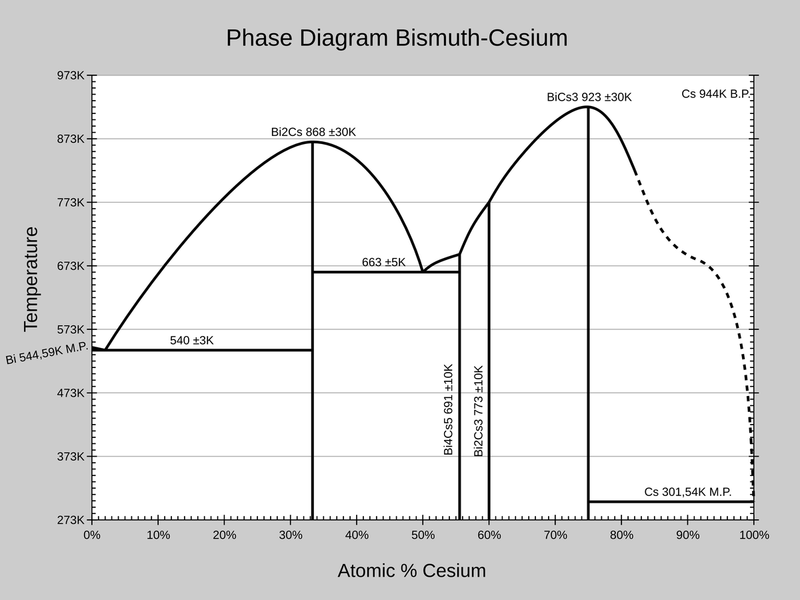 Bi2Cs (melting point 868K/595°C) or BiCs3 (MP 923K/650°C) – also see BiCs phase diagram. 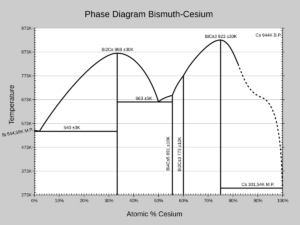 The sublimation temperature of the intermetallic compound Bi2Cs at a pressure of 1×10-4 Pa is about 723K/450°C, which is 430K more than the sublimation temperature of pure caesium which is 295K/22°C at a pressure of 1×10-4 Pa. Our standard alkali alloys are ideal for the application in high vacuum. The desired alloy containing the alkali metal is specially produced under ultra high vacuum conditions in our company. 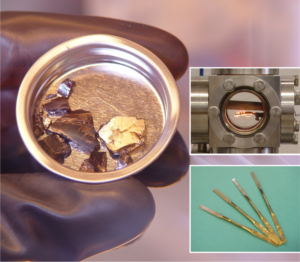 A small stainless steel tube – which is gas-tight sealed by a pressed indium sealing – is filled with the alloy or pure element under argon atmosphere. When used, the source is heated via conventional resistance heating. Or heating the whole chamber. As a consequence, the indium sealing melts and the small argon puffer is pumped away during the standard bake-out procedure. A mechanical unsealing of the indium seal is also possible. In this case it has to be considered that the mechanical treatment and the subsequent transport in your application has to be carried out under inert atmosphere. The AlfaSource releases the desired ultra-pure alkali metal when the required sublimation temperature is reached due to the activation current. There is only one physical natural limit when using AlfaSources: the temperature, i.e. the current, must not be increased above the indicated specification limit to prevent sublimation of non-alkali metals in the alloy and to prevent the AlfaSource from melting like a fuse. AlfaSources can be mounted under ambient air conditions. Avoid bending of the sources, otherwise the seals can get leaky. Also do not damage the rippled areas (with the zig-zag or X pattern) of the contact flaps: No drilling or trimming! can result from current flow or external heating. The current flow varies due to the selected temperature, type and size of the AlfaSource and the installation situation and the electrical generator used. For this reason, the relationship between current and temperature given below is to be understood as orientation only. Depending on their specific installation situation, the values may differ considerably. The desired temperatures must be achieved by slowly increasing the current. When the current changes, it may take a few minutes until a stable temperature level is reached again. 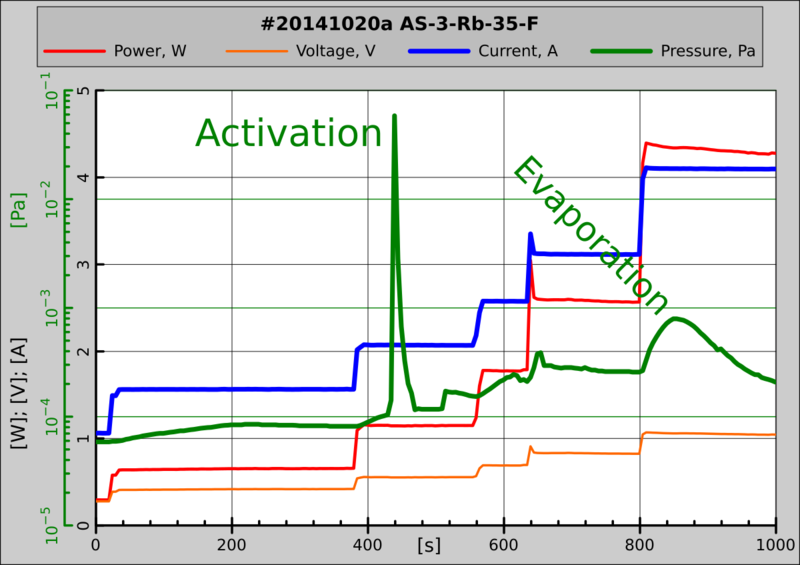 Activation results from melting the indium seal while the vacuum pump is running and can be monitored by measuring the total pressure. The temperature at the seal should be 450K for 30 minutes. If the bake out temperature at least 600K the activation temperature my be raised to 500K and the time can be reduced to 10 minutes. 450K is usually reached with 1.2 and 4.0 A – depending on size, type and installation situation. 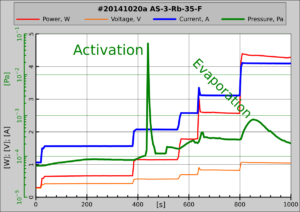 Argon is released and generates one or more short pressure peaks. The Bake-out must stay within the specified temperature limits and can include activation at the same time. Please note: Some elements have a lower bake-out temperature than is required during activation. The element evaporates between 3 A and 17 A, depending on size, type and installation situation, respective corresponding to the temperature table. The rate of evaporation increases with higher temperature and decreases over time. For the maximum allowable temperatures for bake-out, activation and evaporation check the table below. The currents corresponding to the temperatures are on the next point in the current-temperature graph. Activation temperature 450K for at least 30 minutes. 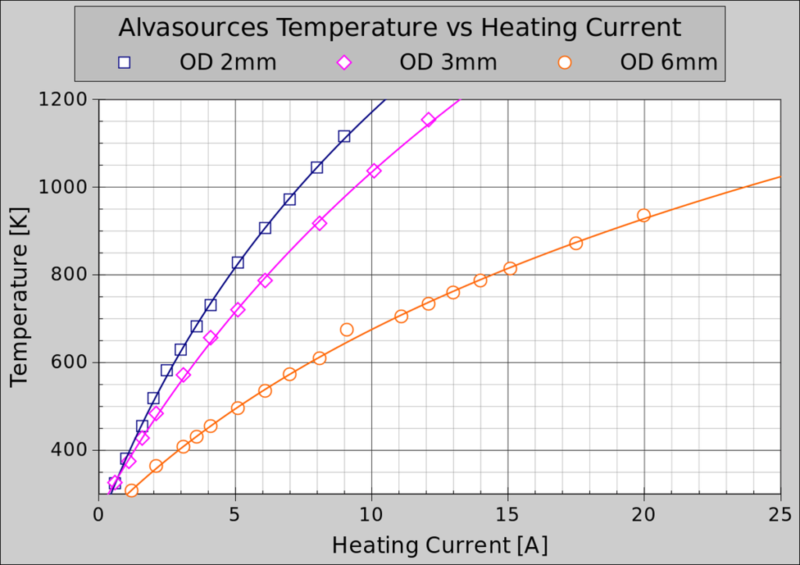 The temperature at the stainless steel tube can be determined by the dependence of the temperature of the applied current in the following graph. The values are valid for a contact distance of 100 mm and the specified nominal tube diameter. The design of the AlfaSources guarantees easy handling and functionality. The contact flabs can be attached with simple clamps in each vacuum chamber. Type S can be installed both horizontally and vertically (slot opening on top). The opening can be directed downwards in the horizontal installation in order to allow evaporation downwards. Types F and C are designed for horizontal installation. As long as the opening is pointing upwards, an aslope to vertical installation is also possible. Type V is designed for horizontal installation.